Falls are a major problem in dementia with an annual reported incidence of about 70–80 %, double that of older adults without cognitive impairment. Remaining mobile and free from falls is a priority, and understanding falls in dementia is of critical importance to mitigate the burden caused not only to the patient but also the carer. Despite this, there is currently no convincing evidence to mitigate falls risk in dementia. Gait and balance impairments are important falls risk factors as are cognitive impairment, and more recently the interdependency between these features has been recognized and is influencing assessment and the development of novel therapeutic strategies. 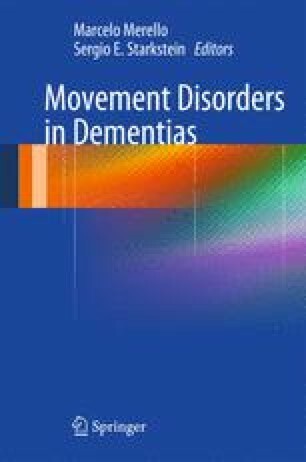 This chapter covers four relevant and important key areas: (1) prevalence, incidence, and risk of falls with respect to different types of dementia including a focus on disorders in gait and balance which are important contributors and medication; (2) emerging evidence for contributory mechanisms; (3) evolving concepts relating to the interrelationship between gait, balance, cognition, and falls; and finally (4) approaches to mitigate falls risk and implications for clinical practice. Department of Health. Improving care for people with dementia. 2013. https://www.gov.uk/government/policies/improving-care-for-people-with-dementia. World Health Organisation. Violence and injury prevention and disability-falls. 2013. http://www.who.int/violence_injury_prevention_other_injury/falls/en/. World Health Organisation. Global Health and Ageing. 2011. http://who.int/ageing/publications/global_health/en/.